Geodesy is usually defined as the measurement and mapping of the Earth. As a science it is traced back to Pythagoras (6th cent. BC), who was thought to be the first to propose the sphericity of the Earth. Later, Eratosthenes (276 BC– 195 BC) was one of the earliest to attempt to determine the dimensions of our Earth and succeeded with remarkable accuracy. A controversial aspect of modern geodesy is the claim that many ancient sites were deliberately established at locations that had specific geodetic relationship to each other and/or the dimensions of the Earth. For example(a) in ancient Egypt, from Giza to the Equator is 1/12th the circumference of the Earth, Amarna to the Equator is 1/13th, Luxor 1/14th and Philae 1/15th! Graham Hancock in his Heaven’s Mirror pointed to similar relationships around the globe suggesting a possible world grid. This idea of a world grid has a number of supporters, but is often classified as a ‘fringe’ interest due to the attempt by some to link gridlines with UFOs and their use of the grid as a power source(w). Possibly related features may be the ley lines identified by Alfred Watkins in Britain(c)(g), the Alesia alignments in France discovered by Xavier Guichard(b) or the Heilige Linien of Germany claimed by Wilhelm Teudt(aa). Heinz Kaminski had claimed to have discovered a megalithic grid system that stretched from Stonehenge across Europe with an east-west and north-south orientation and referred to as the Stonehenge/Wormbach System(h). ‘The Way of Virachoca’ in the Andes which runs through Tiwanaku and is oriented exactly 45° west of true north and runs for over 1000 miles, has been studied by Maria Scholten d’Ebneth in the 1970’s and expanded on by a number of Spanish speaking commentators and is now the subject of an article by Dave Truman(x). In 1973, three Russians, engineers Valery Makarov and Vyacheslav Morozov along with Nikolay Goncharov, an artist, published in Russian an article with the eye-catching title of Is the Earth a Giant Crystal? 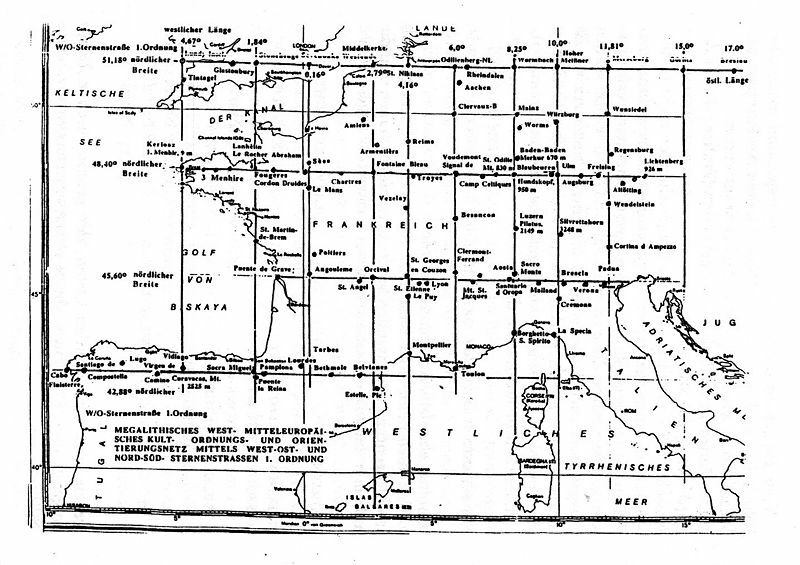 (y) This was probably the earliest presentation of an earth grid based on ancient historical sites. A brief history of the earth grid theories that emerged around this time is available online(z). There is now a Russian geodesy website with an English translation(ab). David Hatcher Childress published his Anti-Gravity and the World Grid in 1993, with the modest claim that he “proves that the earth is surrounded by an intricate electronic grid network offering free energy.” Obviously, Childress’ understanding of ‘proof’ is different to mine, as the only proof required is the production of some of this free energy, which he has not done. Tom Brooks has entered the fray with a study of 1500 prehistoric sites and his conclusion that the inhabitants of ancient Britain had a designed a navigation system based on a grid of isosceles triangles(i). Brooks has gone a step further and speculatively claimed that the accuracy of this geometry-based system could only have been designed through “extraterrestrial intervention”(r). This concept is explored more fully in his latest book, Seeing Around Corners: Geometry in Stone Age Britain and in a series of video clips(s). A more critical view of Brooks’ ideas is also available on the Internet(j). Some years ago a former employee of a NASA sub-contractor, Maurice Chatelain claimed that within a 450-mile radius of the Aegean island of Delos that 13 mystical sites, when connected by straight lines formed a perfect Maltese Cross(u)! Others such as Livio Stecchini(d) and Jim Alison(e) using geodetic calculations have identified São Tomé and Cape Verde respectively as the location of Atlantis. I must also include Hugo Kennes, a Belgian researcher with a passionate interest in global grids and sacred geometry(l)(p). Kennes has also informed me of a new Facebook group(q) deal with all aspects of the subject, as well as another(v) that includes submerged cities and other features. Anyone interested in pursuing a study of this subject might like to look over James Q. Jacobs’ archaeogeodesy website(f) as well as the BioGeometry website (m). If you have pursued all the links so far, you can pamper yourself further with a paper(k) by William Becker and Beth Hagens(n). Another researcher in this field is Dan Shaw whose website(o) give a good overview of the subject. Jean-Pierre Lacroix added his weight to the debate with his 1998 paper entitled The Mapmakers from the Ice Age(t). I am somewhat sceptical about certain aspects of geodesy, particularly some of the claims of a world grid. However, it does raise many questions that require further study. In this connection, I would recommend John Sase’s Curious Alignments  as a good starting point. 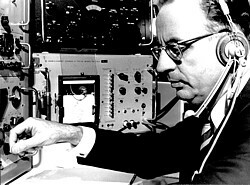 Professor Heinz Kaminski (1921-2002) was a German chemical engineer and space researcher. He also had an interest in Atlantis and expressed his ideas in a couple of books that located Plato’s island in the Atlantic . Unfortunately, he included as ’sources’, Cayce and Steiner, abandoning any possible claim of scientific objectivity. Kaminski spoke of ‘spiritual science’ and thought that the Atlantis mystery could only be solved through faith. His books have had some scathing reviews by German commentators. In his Von Stonehenge nach Atlantis Kaminski proposed the existence of a megalithic grid in Europe which ran from Stonehenge across Europe with an east-west and north-south orientation, sometimes referred to as the Stonehenge/Wormbach System(a).